Servo Motor vs Stepper Motor: Which is right for your application? It is an engineering truism that there is no perfect solution, just the best solution for the problem at hand. That holds particularly for servo motors and stepper motors. Both are broadly used in industry. Neither is a universal solution. When properly applied, however, both stepper motor and servo motor can provide effective, reliable power for a highly successful system. The decision tree for choosing between the two has many branches but the most important are speed, acceleration, and price target. Stepper motors consist of a rotor with permanent magnets and a stationary stator that carries the windings. When current runs through the stator windings, it generates a magnetic flux distribution that interacts with the magnetic field distribution of the rotor to apply a turning force. Stepper motors feature very high pole counts, typically 50 or more. The stepper motor driver energizes each pole in sequence so that the rotor turns in a series of increments, or steps. Because of the very high pole count, the motion appears to be continuous. Stepper motors have a number of positive attributes. Because they generate incremental motion, they are generally run open loop, eliminating the cost and complexity of an encoder or resolver. The high pole count allows them to generate very high torque at zero speed. They are compact and generally economical (see figure 1). On the downside, stepper motors have speed limitations. They generally run best at 1200 RPM or lower. Although they generate high torque at zero speed, torque falls off as speed increases (see figure 2). A motor that generates 100 ounce inches at zero speed might only deliver 50 ounce inches at 500 RPM, for example, and just 10 ounce inches at 1000 RPM. In theory, a gearbox could be used to increase torque, but this is where the low speed of stepper motors becomes a problem. Adding a 10:1 gear reducer to a 1200 RPM stepper motor might boost the torque by an order of magnitude but it will also drop the speed to 120 RPM. 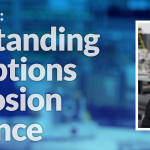 If the motor is being used to drive a ball-screw actuator or similar, it probably will not deliver sufficient speed to satisfy the needs of the application. Stepper motors generally are not available in frame sizes larger than NEMA 34, with most applications falling in the NEMA 17 or NEMA 23 motor sizes. As a result, it is unusual to find stepper motors capable of producing more than 1000 to 2000 ounce inches of torque. Stepper motors also have performance limitations. You can think of a stepper motor as a spring-mass system. The motor needs to break friction to begin turning and move the load, at which point the rotor is not fully controlled. As a result, a command to advance by five steps may only result in the motor turning four steps – or six. If the drive commands a motor to advance 200 steps, however, it will do so to within just a few steps, which at that point represents an error of a few percent. 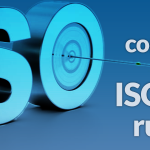 Although we command stepper motors with a resolution of typically between 25,000 and 50,000 counts per revolution, because the motor is a spring-mass system under load, our typical resolution is 2000 to 6000 counts per revolution. Still, at these resolutions, even a 200-step move corresponds to a fraction of a degree. Adding an encoder will enable the system to accurately track movement, but it will not be able to overcome the basic physics of the motor. 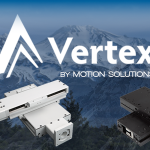 For applications requiring improved positioning accuracy and resolution, servo motors provide a better solution. Like stepper motors, servo motors have many implementations. Let’s consider the most common design, which incorporates a rotor with permanent magnets and a stationary stator with the windings. Here too, the current creates a magnetic field distribution that acts on the rotor to develop torque. Servo motors have significantly lower pole counts than stepper motors, however. As a result, they must be run closed-loop. In general, servo motors are more sophisticated than stepper motors. 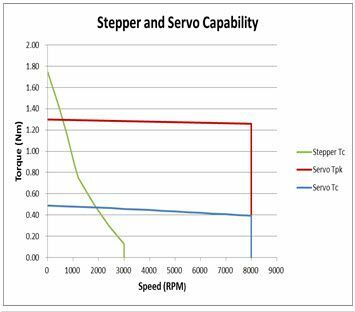 They run significantly faster than stepper motors, with speeds on the order of several thousand RPMs (see figure 3). 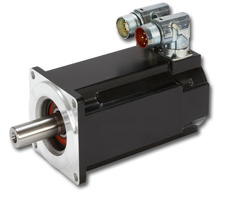 This enables servo motors to be used with gearboxes to deliver much higher torque at useful speeds. They also deliver more consistent torque across the speed range of the motor. Unlike stepper motors, they do not have holding torque per se. Closed-loop operation enables the controller/drive to command that the load remain at a specific position, however, and the motor will make continual adjustments to hold it there. Thus, servo motors can deliver de facto holding torque. Note, however, the zero-speed torque scenario depends upon the motor being sized properly to control the load and prevent oscillation about the commanded location. Servo motors typically use rare-earth magnets while stepper motors more frequently use less expensive conventional magnets. Rare-earth magnets enable the development of higher torque in a smaller package. Servo motors also gain a torque advantage from their overall physical size. Servo motor diameters typically range from NEMA 17 all the way up to 220 mm. as a result of these combined factors, servo motors can deliver torques of up to 250 foot-pounds. The combination of speed and torque enables servo motors to deliver better acceleration than stepper motors. 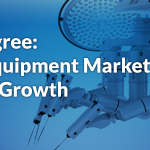 They also deliver improved positioning accuracy as a result of closed-loop operation. Servo motors offer an undeniable performance advantage. In terms of repeatability, however, stepper motors can be quite competitive. This point brings up a common misconception about stepper motors, which is the myth of lost motion. As we discussed previously, the mass-spring nature of a stepper motor may result in a few lost steps. Because the drive is commanding the stepper to move to an angular location, lost steps are not carried over from rotation to rotation, however. Rotation to rotation, stepper motors are highly repeatable. Look for a more detailed discussion of this topic in a future blog post. 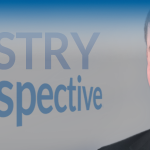 The discussion above brings us to a final key differentiation between stepper axes and servo axes, which is cost. Stepper motors typically don’t require feedback, they use less expensive magnets, and they rarely incorporate gearboxes. Because of the high pole count and their ability to generate holding torque, they consume less power at zero speed. As a result, a stepper motor can be up to an order of magnitude less expensive than a comparable servo motor. To summarize, stepper motors are good solutions for applications with low speed, low acceleration, and low accuracy requirements. 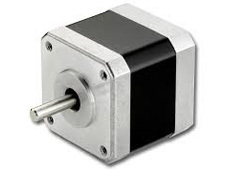 Stepper motors also tend to be compact and inexpensive. This makes these motors a good fit for medical, biotech, security and defense, and semiconductor manufacturing applications. Servo motors are a better choice for systems requiring high speed, high acceleration, and high accuracy. The trade-off is a higher cost and complexity. Servo motors are typically used in packaging, converting, web processing, and similar applications. When your application is forgiving but your budget is not, consider a stepper motor. If performance is the most important aspect, a servo motor will do the job but be prepared to pay more. 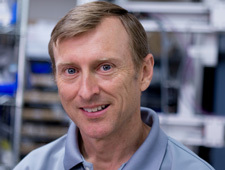 Bill Lackey is vice president of engineered sales, Motion Solutions.